Sekhmet Chapel, Karnack Temple, Luxor Egypt, January 26, 2009 photo by D. Morse I’m in the green shirt and Rachael Salley is in right corner. We are standing in front of the 3500 year old statue of Sekhmet, the lion headed goddess. The Egyptian guardian is taking energy from the statue and putting it on us. Temple of Dendera, Egypt, January 26, 2010 photo by Evans Bowen I took this photo as I was leaving. The Temple is dedicated to the goddess Hathor. The apparition is more than an ordinary orb but I’m not sure what it is. 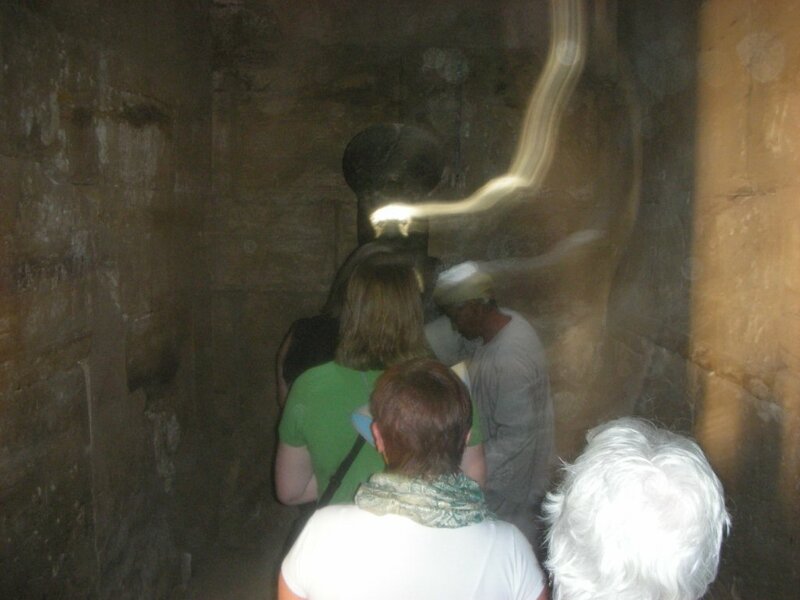 Orbs are very common in pictures of Egypt. Temple of the Condor, Ollantaytombo, Peru September 2011 photo by E Bowen. The beautiful puple orb also showed up in a friend’s picture taken at the same time. It is an incredibly peaceful spot, I could have stayed there all day. Big Horn Medicine Wheel, Wyoming July 19, 2006 photo E. Bowen My first spirit photo. This same pink line was in one other photo. This is the day the Medicine Wheel was aligned to the rising of the star Rigel in Orion.